Over the past four and a half years of blogging, there's been a lot of blog posts that I've been excited to share with y'all. (Expanding on that - if I'm not excited to share a post, why even share it right?) But out of the hundreds of blog posts.... this might really be the one I've been MOST excited to share! These pictures were taken in a place that can only be described as an Instagrammer's ultimate dream come true. 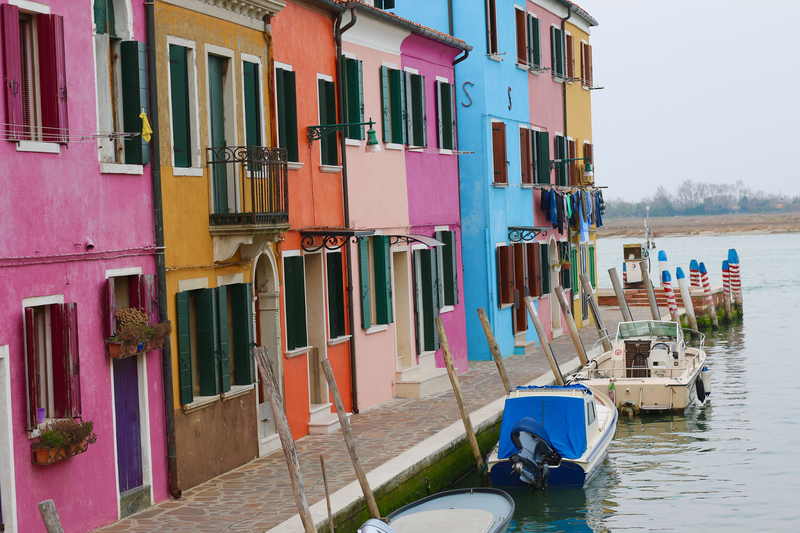 I consider myself to be a self proclaimed geography nerd, so I was SHOCKED upon beginning our tour to learn that I didn't actually know where in Italy the island of Burano was! 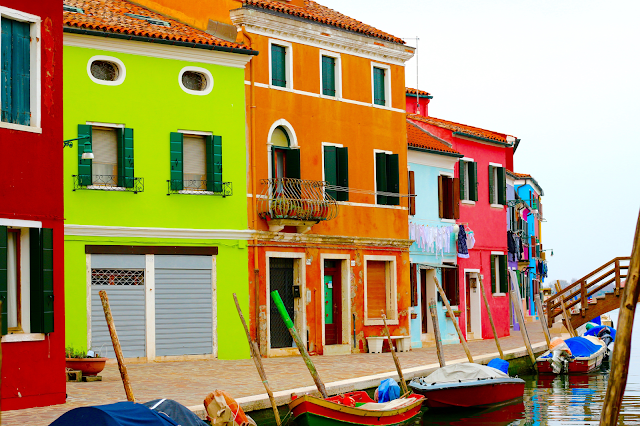 I had heard of this colorful little place before, but I'd always thought it was in the Amalfi Coast, near Capri. That is the one region of Italy that our tour didn't venture near, so I just assumed this wouldn't be a place I'd get to visit on this trip to Europe. Imagine my surprise to learn that Burano is actually an island off of the main islands of the city of Venice in northeastern Italy, and was easily accessible as a day trip from Venice. And Venice was the last stop on our tour! 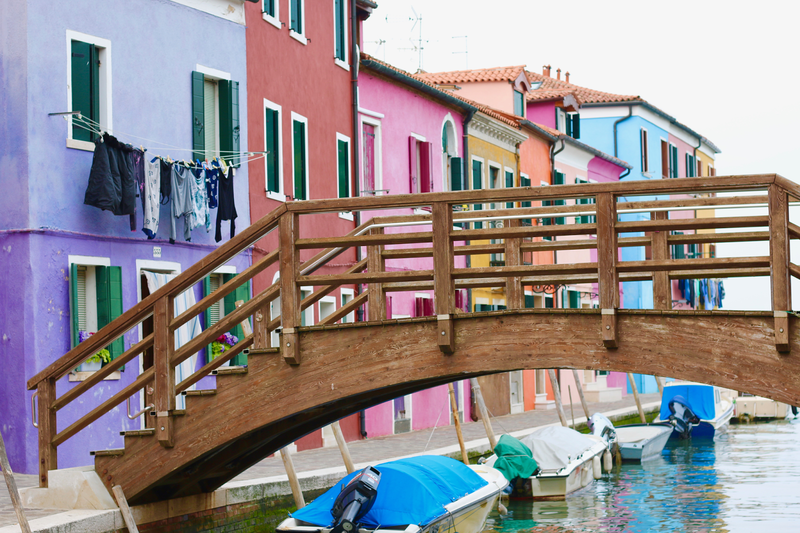 Burano itself is a small island with few restaurants and hotels, so most tourists opt to stay in Venice and make a day trip out like our tour group did. 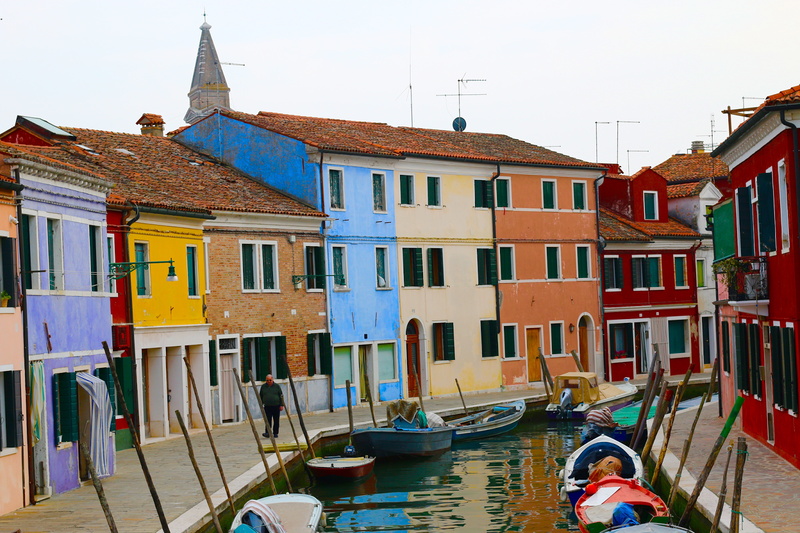 Our tour guide organized a day trip excursion to Burano, where we traveled by boat to the island, and then our entire group had a late lunch of local seafood cuisine at a restaurant there. We only had a couple hours in Burano, and unfortunately most of the time seemed to be taken up in the restaurant! I asked my mom if we could cut out of the lunch a little bit early so that we would have more time to explore. 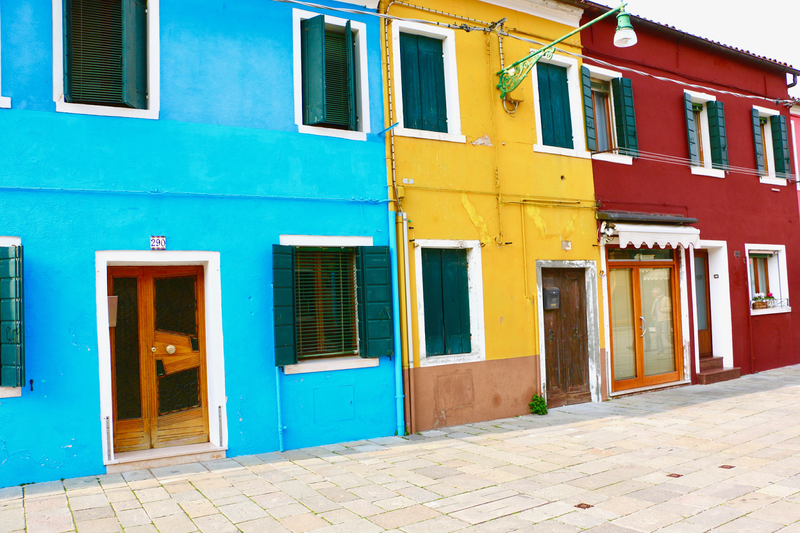 Burano and its beautiful colored buildings are a once in a lifetime experience, and I didn't want to spend the majority of my time there in a restaurant. We had maybe 20 minutes to ourselves to explore, and we walked down one of the first streets that we came upon, which is where these photos were taken. As we walked down the sidewalk, following the canal, I was so in awe of how beautiful each house was! Each one became more beautiful and vibrant in color than the last! We didn't have much time at all, but I was able to get a few outfit pictures, and then my mom and I both took the rest of the time to take scenic shots. .... I mean, how BEAUTIFUL?! Below, I had some fun playing with the colors and edits on a few of my Burano photos. 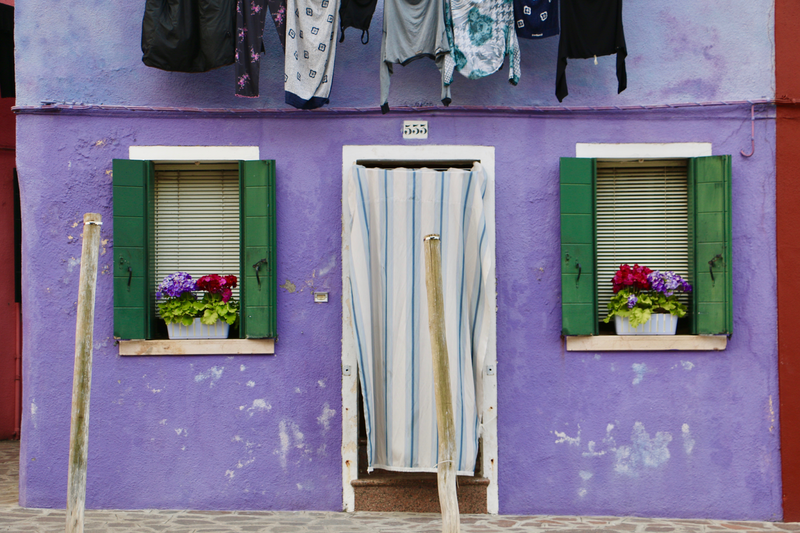 Despite the fact that our time in Burano was way too short, and that it was a bit cold and cloudy on our day there, this was by far the highlight of my time in Italy! I didn't think anything could beat visiting the spots from the Lizzie McGuire movie... but I guess I was wrong! 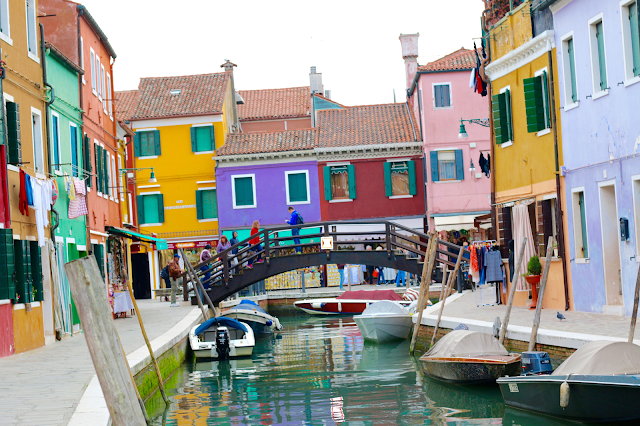 I only hope that I'll be lucky enough to return to Burano someday! 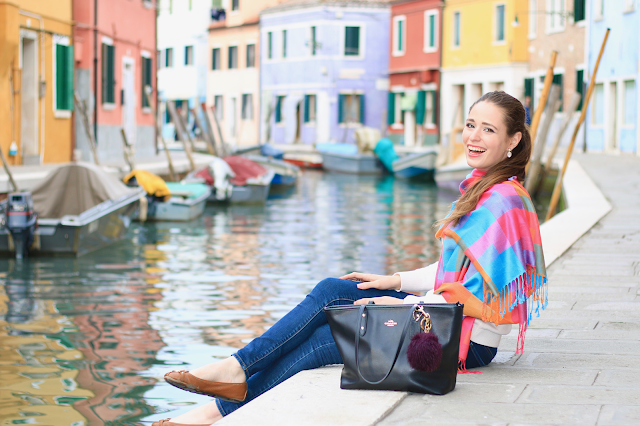 Thank you so much for following along with all of my Italy blog posts! I feel so blessed and lucky to have gone on such a memorable adventure before moving to Vermont and starting my new job (in which I don't get much vacation time for my first year at work!). Oh my goodness, Burano looks gorgeous! Definitely adding it to my travel bucket list and I love your outfit too! Obsessed with how these photos turned out and your scarf goes so well with this location! Will def have to add this place to my travel bucket list! Oh my goodness. Buramo is absolutely gorgeous!! What a colorful little city. 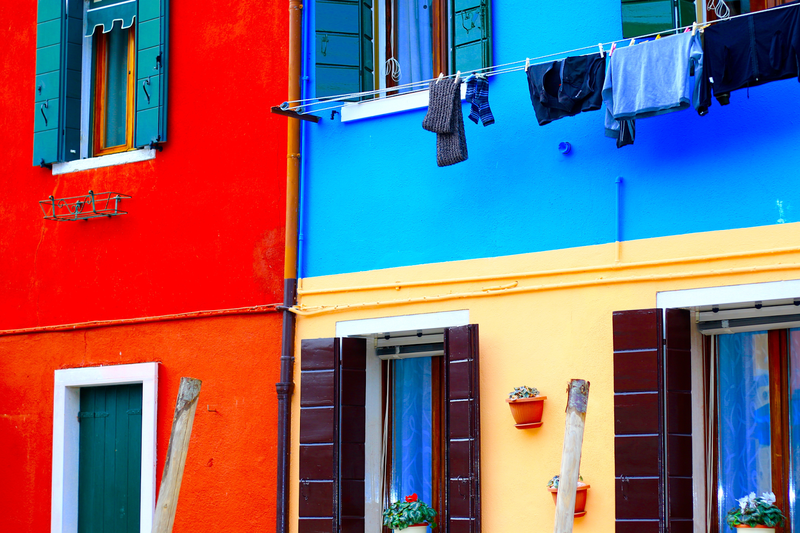 Burano* whoops! That's what I get for commenting on my phone. Oh my goodness, it's so so beautiful! I love all of the colours! You look like such an elegant woman of the world! Also, your hair is amazing! This soooo beautiful! I have to add it to my list. I love how colorful everything is! Wow.. I just died a little in side. I wanna go to italy so bad! some of my family lives there I would love to go to see them. I am obsessed with this post, how beautiful! Wow, those houses are all kinds of bright!!! But they are so gorgeous <3 And I love how your scarf's bright colors go with the houses! Burano looks incredible!!! I'm dying over all of the colors. I'm hoping Italy is my next international travel spot! Wow, Italy looks absolutely beautiful! And even though it might be cold, you're doing an amazing job embracing summer colors in your scarf. I love your photos! Your outfit's also really nice :) The white sweater is something I'd love to get! 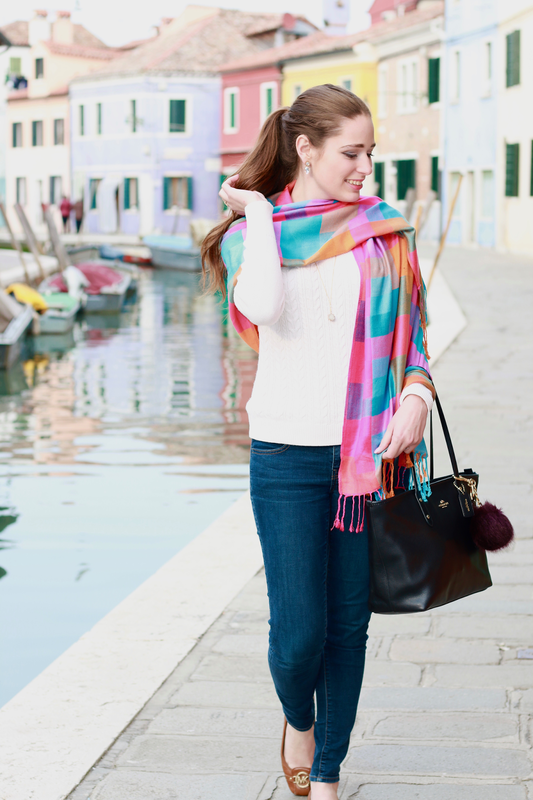 Wow, Burano looks amazing- and kudos to you for matching it perfectly with that fabulous scarf!